In a lot of ways, my brother and I share a lot of the same opinions, but there are a few subjects where we disagree vehemently. One of the places where our difference of opinion has led to conflict has been on the subject of gift giving. To explain the paradox of our situation, I wrote the following allegory. Once there were two brothers who had to buy each other gifts. Brother Will believed that the value of the gift lay in the utility that it brought to the receiver. He believed it was the benefit that counts. As such, he would even go so far as to ask the receiver what it is they wanted, rather than risk a mistake. Brother Andrew believed that the value of the gift lay in the effort the giver exerted in trying to pick the gift. He believed it was the thought that counts. As such, he would be pleased with a gift that the receiver immediately threw away as long as the receiver believed that Andrew had thought long and hard to pick it out. When the brothers came to give each other gifts, they were doomed to fail. If Brother Andrew aimed to search his soul for what Brother Will would truly want, he would inevitably come to the realization that he must give up being thoughtful and directly ask Brother Will, even if it meant that his gift didn’t truly represent his feelings. If Brother Will aimed to give a gift that Brother Andrew would value highly, he would have to forgo his philosophy of directly ascertaining the gift of highest value, and instead project his feelings about Andrew into his selection of a gift, even though he might be wrong. Long story short, I am the utilitarian, and my brother is the romantic. This dichotomy has been largely fine from my viewpoint for many years: I just ask my brother what he needs and then ship it; my brother gets me gifts I don't need, and I give them away to other people. However, earlier this month my brother actually managed to nail it with his gift and get me something that I really liked that I didn't even know I needed, which made me reconsider my approach. I suddenly found a new respect for the contemplation required in his style, so for his best man's gift, I decided I'd to try something different. 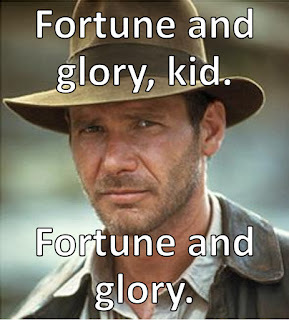 Both my brother and I grew up loving Indiana Jones, as every kid should. My brother has dressed up as Indiana on many occasions, and our mother even somehow let us buy bullwhips when we were kids. When I got my PhD from the University of Chicago, my brother wanted to commemorate it with something that acknowledged that Dr. Jones and I are both alumni of the same institution. 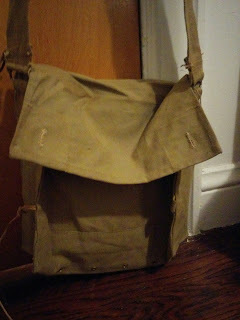 He thought long and hard on the gift, and decided to get me a WWII gas mask bag like the one Indiana uses to carry his stolen loot (I mean archaeological findings). Although I didn't realize it at first, this turned out to be a very practical and useful gift. Having this satchel is a great way to carry just a few things while going on hikes without having to lug a whole backpack. Plus it's just inherently really cool to walk around with a piece of Indiana Jones gear on. When I got my brother a gift for being my best man and officiating my wedding, I wanted to make it something practical, but I also wanted to continue the adventurous spirit. Importantly, I wanted to make sure the delivery was part of the gift itself. The best thing I could think of was to get something that would enable my brother to finish a project that he's been wanting to execute on for a while now. He has a good idea for a board game, but he has never gotten around to finishing it and building it. To help him get it made, I got him credits with Game Crafter to get all the pieces printed and delivered as soon as he finalizes the plans. I thought it would be too hard to get someone to figure out both a website and complex 16 character promo code so instead I just created a fake Indiana Jones themed email and had the promo code sent there. 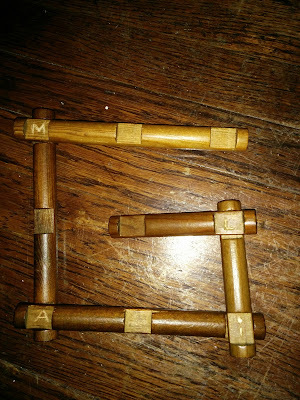 For the puzzle he has to figure out to check gmail and the username and password from the hints I give. As an added bonus, I'm not going to directly reveal to him that there's a puzzle at all. I'm just going to hint at it with my clues a couple of times during my wedding weekend. For the first clue, I'm trying to be subtle enough that he could still doubt whether there is anything going on at all. To do this, I'm pretending that the first clue was actually hidden in the gift that he gave me. He bought it online so there's some chance that he'll believe that it was an easter egg from the person selling it. 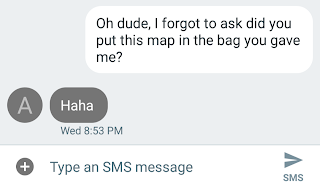 I know it's a long shot, but even if he only has the tiniest momentary sensation that I didn't put it there, then that will make it just a little bit mysterious. The clue is a pretty basic map of the Caribbean that I found a few days ago on the sidewalk. To make it look more "authentic," I stained it with coffee folded it up and ripped one edge. The symbolism of this token is that another name for the Caribbean is the West Indies, and Indy is Dr. Jones' abbreviated nickname. I didn't want to make it too obvious so I used a reference from a fairly obscure Indiana Jones novel, Indiana Jones and the Army of the Dead. 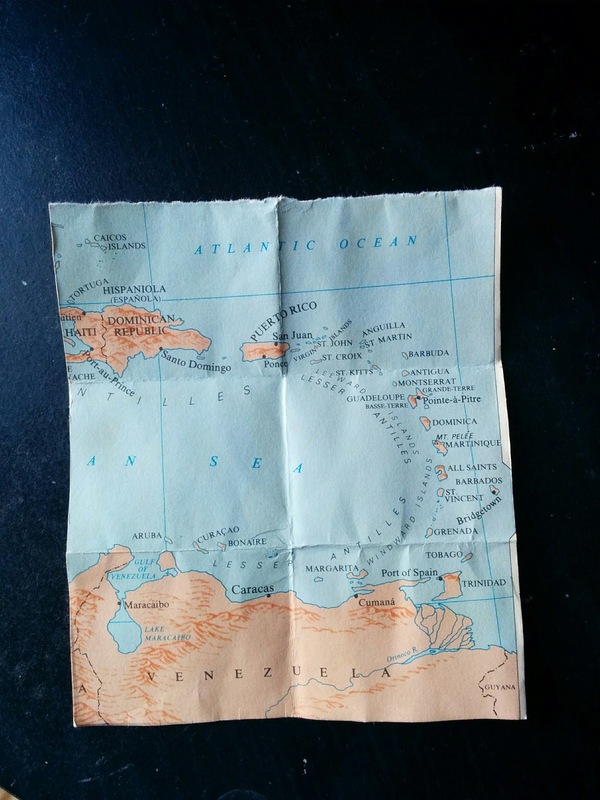 The Island that Indiana and crew visit in the book is Called Zile Muri-yo, which is more ore less a transliteration of the French, Isle de Mort, or Island of the Dead. This is essentially the only reference I could find that put Indy somewhere in the West Indies so I kind of had to use it. From this, hopefully my brother can deduce that zilemuriyo@gmail.com is the email address he'll be looking for. Of course, at this point he doesn't know anything about an email account. That clue comes later. 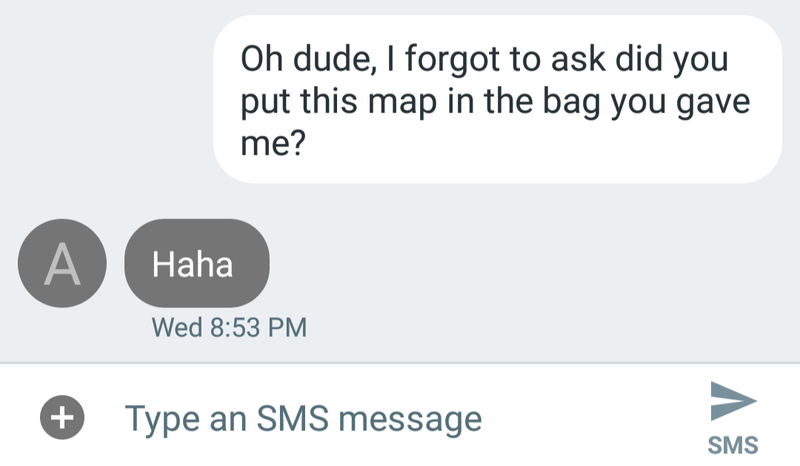 As a premature setup, I also sent him a text mentioning that I found a map at the bottom of the bag he gave me. Of course, his text response shows that he isn't that gullible. Next up we have the red herring, specially equipped with a classic coded puzzle. My brother will expect a best man gift so I'm going to need to give him something early on to throw him off the trail. 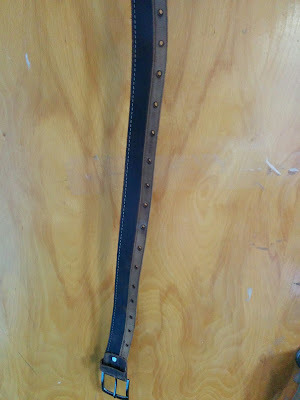 The item I've chosen is an odd leather belt that I got a few years back. It says made in India so I'm going to suggest that it was fashioned in the region of India where Temple of Doom is set. This is another subtle clue because encoded in the belt is a message that comes from that film. The belt has those weird holes poked through it all along the edge. The secret is that I'm stringing thread in a Morse code pattern between and among the holes. I'm using two types of thread. Presumably, this is hideous enough that my brother will notice there must be something up with the strings randomly strewn across a weird looking belt. The two colors each encode a different word. One is fortune, the other is glory. From this, hopefully my brother will guess that fortuneandglory is the password. "Fortune and glory" is famously what Indiana (and everyone) is seeking on adventures. Still, he probably won't know at this point that he's looking for an email address, but he and I have both used that trick before so he might see it coming. Anyway, just in case, that is where the last clue comes in. 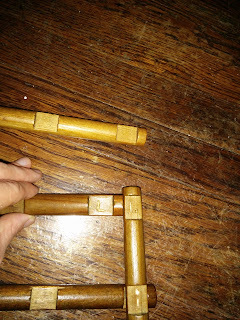 The last clue is going to be hidden in a gift I give to my brother's daughter, Penny. 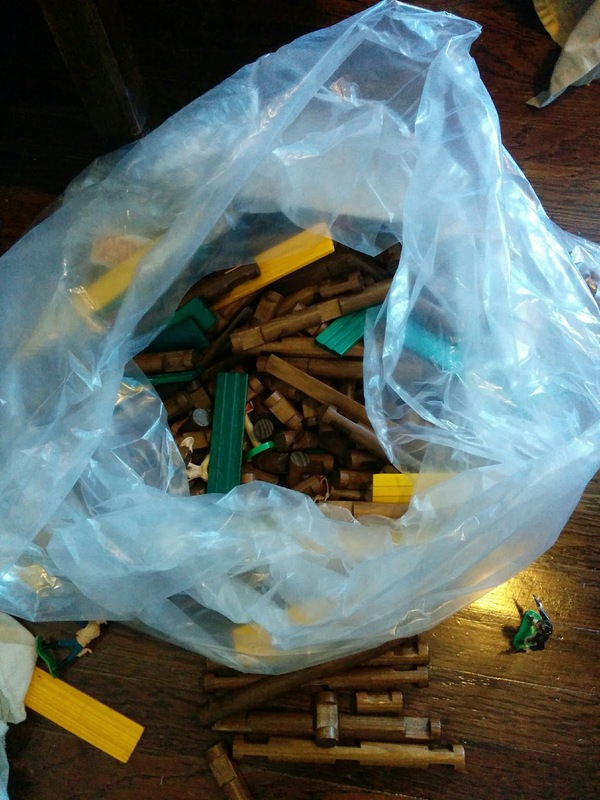 I got her several boxes worth of Lincoln Logs because she likes building things. I'll be giving her the bulk of the toys on Sunday at her birthday party, but, on Friday night before my wedding, I'm going to give my brother a little teaser of 5 lincoln logs and a figurine that looks a bit like Indiana. The trick is that on some of the flat faces of the logs, there are little letters carved in: A, I, L, and M.
Since each letter appears twice, the puzzle can be solved by constructing them together such that the same letters overlap. When he does that, he should hopefully see that the logs form the shape of a capital G.
That along with the letters MAIL, should presumably help make it clear how to use the other two clues in some combination. Then, if everything goes according to plan, he'll log in and get the Elusive Promo Code. Overall, the delivery didn't go as well as I expected. The big issue was that I didn't make it obvious enough that there was a puzzle to solve. 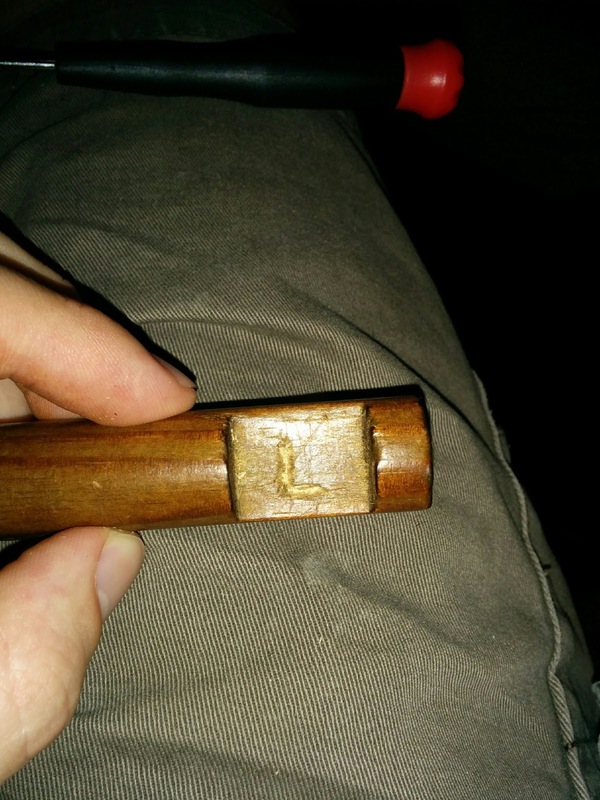 I went out of my way to make it seem like finding the map was an accident, and that the belt came that way. This led to some confusion. Even after my brother knew, he felt too pressured having to work on the problems while visiting family. There was also a technical problem with the construction of the Morse code belt that hampered the puzzle solving. 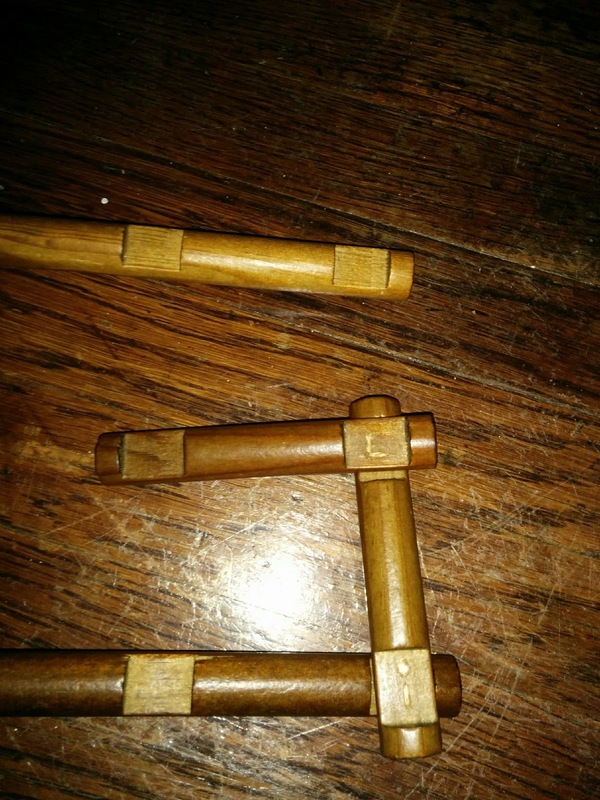 Many of the threads came untied when transporting the belt around so there was an incomplete message by the time my brother was ready to solve the puzzle. 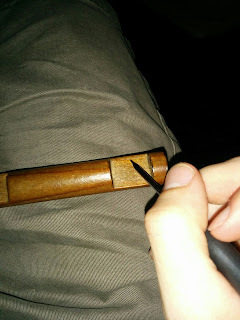 In the end, I had to give that clue away because it was just to hard to solve with some threads missing. But in the end, I think my brother was really happy with the effort I put into both gift selection and delivery. And although it took a lot more work, I had a lot of fun building the puzzle. I think I'll try to keep this up with the next gift I give him, and maybe carry it over to my niece when she's old enough. The best part is that since we're brothers, I know that sooner or later the temptation to one-up each other will kick in. I'm looking forward to my brother coming up with something even more clever for my next gift.